Jennifer and Barbara at the Hughes house for Christmas in 1991. Barbara lights her candle off of Sabrina's while holding Jenn. Jennifer and Aaron Snyder practice their modeling for Barbara's BRO fashion show in 1993. Barbara and Jennifer and BRO's February 1993 fashion show. Jennifer models BRO's new children's line. Barbara tells the crowd that Jennifer is her daughter. Hal arrives at the Hughes house with Nikki, Jenn, and baby Will. 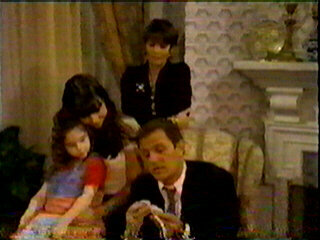 Hal shows Nikki and Jenn how to tie a knot, while Barbara looks on.